creating a wildlife corridor (stepping stone model) that offers refuge to all kinds of beneficial urban wildlife. If you’d like to help us accomplish all of these goals (and more! ), please consider volunteering. Click here to sign up: Volunteer. We are grateful for all of the joyful energy of our members, volunteers, and supporters over this past year. Thanks to all of you 2017 was a year of action! We wanted to reflect on what 2017 meant to us. Its hard to believe its almost time to say goodbye to 2017, though those of us working in gardens and natural systems have been saying goodbye for a while. Fewer and fewer pollinators have visited the last remaining asters. Butterflies and their caterpillars have found their winter refuges in our gardens. We have watched flowers going to seed and the seasonal shifts of our residential birds. Dark-eyed Juncoes have arrived, formed their flocks, and marked out their foraging spots. Our gardens have functioned as waystations, making lives easier or even possible for migratory birds who are traversing continents, cultures, and habitats to their overwintering grounds in South and Central America. As I cleaned milkweed seed, it occurred to me that these seeds are actually footsteps of a bee or a butterfly. When you begin to question milkweed pollination, a complex mystery unfolds. For details, see Milkweed Pollination. Put simply here, a pollen structure must attach to a pollinators foot. The pollinator then must carry it to another flower, where it inserts this pollen package. A milkweed flower is really a cluster of thousands of tiny flowers, and one flower will produce a pod of over a hundred seeds. Thanks to tiny feet (or tarsi), we can receive the next generation of milkweed. The work, or the steps, of the pollinator live on. Many such footsteps mark our gardens, whether visibly or invisibly. They might change our garden in surprising ways, bringing unexpected, wonderful visitors. Our plants continue to give all winter and support life, so please keep plants standing if you can. Everything is connected. As you will see in the list below of what weve been up to, we joined forces with Green Community Connections (GCC) to spread the Monarch Magic. GCCs programs around Monarchs were incredibly successful. Because of Sally Stovall, Oak Park is now a Mayors for Monarchs village. The village worked hard to plant milkweed and nectar plants to support Monarchs and other pollinators. This level of collaboration was immensely gratifying as we met mutual goals and strengthened each others mission. It is vital that our organizations support each other so that we can continue to benefit from our distinctive strengths. One hallmark of Wild Ones is the speaker series. As you will notice, scientists are important to us. We are so lucky to live in an area where professors are willing to share their research and knowledge with the public. We have also heard from professionals in the native landscaping or peers deeply experienced in living with native plants. Each contributes to our knowledge, understanding, and appreciation for the natural world. Thank you to all of our wonderful speakers! And many people are harnessing their power in their yards. The sale, in partnership with Green Community Connections, helped people get new native trees and shrubs, many of which are hard to find easily and locally. These trees and shrubs provide butterflies, moths, birds, and bees many different resources. Planting trees and shrubs is also a great way to help out the environment. We are offering canopy trees (taller species), understory trees, and shrubs in order to make it easy for anyone to create a layered landscape that offers interest and wildlife support throughout the year. Many of the plants produce spring flowers; then berries or nuts and other types of seeds develop in the fall and winter. Not only do these plants provide habitat and food for wildlife, they sequester carbon, clean the air and water, and provide numerous other benefits. You can forest bathe right in your own backyard! We expanded our offerings this year: Blue Beech, Dwarf Honeysuckle, Red-stem Dogwood, Bladdernut, Pagoda Dogwood, Juneberry, and more. 15 gardens, hundreds of species=endless variations. People were inspired by the knowledge and creativity of the hosts. 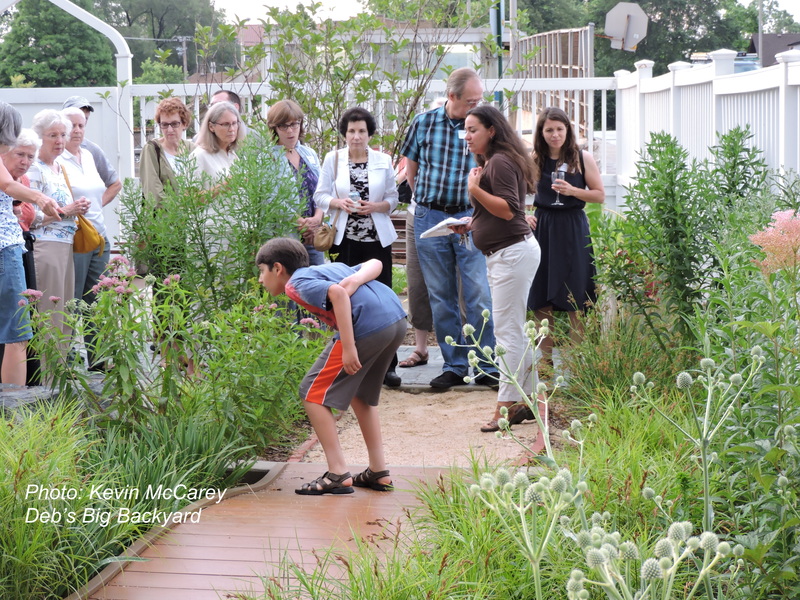 The Interfaith Green Network, Green Community Connections and West Cook Wild Ones are collaborating on Birds, Bees & Butterflies: A Native Garden Tour in Oak Park and River Forest on Sunday, August 6, 1-4pm. You will learn more about what native plants are, how to grow them and how to include natives in your garden plans. The tour will include public and private native gardens at the peak of the season where you will see a how vital and attractive native plants are to birds, bees and butterflies. The tour will include unique plants for shade, sun, rain gardens, clay soil and other applications will be highlighted. Information will be offered for participants new to native gardening and ideas will be exchanged among experienced native plant gardeners. To register, follow this link: Native Garden Tour Tickets Adult tickets are $10, kids 18 and younger are free. The tour begins at the Cook County Forest Preserve at the northwest corner of Lake and Harlem. Please contact judy.klem@gmail.com to learn more. We also have volunteer opportunities: Native Garden Tour Volunteer Sign-up. A big THANK YOU to everyone who supported West Cook Wild Ones through our plant sale and all the butterflies, bees, birds and other creatures through planting natives! TO ANYONE WHO MISSED THE JUNE 24th PICK-UP OF THEIR PLANTS AND DID NOT MAKE PRIOR ARRANGEMENTS, PLEASE Contact Us. We may have some extra Monarch Kits available in July. If so, we will let you know how to purchase one. The school PTOs will be receiving checks for $8 per Monarch kit once our finances from the sale are settled. If you liked our plant sale, consider VOLUNTEERING to help next year. More help makes plant sorting and pick-up go quicker! Our online site is open, and you can start pre-ordering now. We’ve added a few new plants this year. 2017 West Cook Wild Ones Plant Sale. Pick up is June 24, 2017 from 10 am to 2 pm at Euclid Methodist Churchs parking lot, 405 S Euclid Ave, Oak Park, IL 60302. Green Community Connections and the Interfaith Green Network will be hosting a native garden tour in collaboration with West Cook Wild Ones sometime during mid-late summer. Date is not finalized yet. We’re looking for yards/gardens that focus on using native plants, trees, and shrubs in the landscape. The gardens should also be attractive to people new to native gardens. If you would like your garden to be considered, please fill out the form below. We will be in touch to set up a time to meet you and see your garden. Thank you so much for considering sharing your garden and helping people learn about IL native plants. Thank you to all who attended our 2017 Conference! It was so inspiring to see so many familiar and new faces at the conference. We feel so hopeful for the future of the environment knowing that all of these people care enough about the Earth and all of its creatures to attend the conference and are going to start or continue adding native plants to their gardens. Read more here: Post about 2017 Conference. Award-winning landscape architect Rick Darke, co-author with Douglas Tallamy of Living Landscape: Design for Beauty and Biodiversity, and Heather Holm, author of Pollinators of Native Plants, will lead a half-day workshop on how to design home landscapes that not only look beautiful but also support the surrounding regional ecosystem. Scientists tell us that our regional ecosystem is under threat. Climate change and land development are stressing nature like never before in our lifetimes. Many native midwestern bee species are in decline from local habitats (http://www.xerces.org/pollinator-redlist/). Invasive buckthorn is the most common tree in metro Chicago (“Urban Trees and Forests of the Chicago Region”). What can we do? Homeowners and other private land owners can help heal nature by choosing native plants in our landscapes. This Naturally Beautiful Garden conference provides practical advice on creating stunning home gardens using layers found in native ecosystems. These layers support life: soil organisms, insects, birds and more. First, Darke will lead the audience in an entertaining discussion of the layers of native ecosystems (ground, forbs, grasses, shrubs, small trees, large trees), and how home gardeners can use the layers in eye-catching, beautiful ways. Next, he will give advice on easy ways to maintain a native home landscape. Then, Holm will describe the habitat and food needs of birds, bees and pollinators, and advise how to support their life cycles by planting specific native trees and shrubs. Learn how you can surround yourself with life and beauty in your garden and landscape! WildOnes is a 501c(3) Not for profit organization. There is no other local organization quite like us. We do a lot of education and outreach on a small budget. Our income is comprised of a small percentage of membership fees from the National WO, a small amount through our plant sale, and a grant. We pay for speakers, for educational materials, plants and support to local organizations and groups. There is even more we could do. We would love to be able to donate more plants, shrubs, and trees and help more people and organizations through new programs. Together we can make a difference by creating a wildlife corridor and providing habitat for the species that need our help. Shrubs are an often missing part of home landscapes, yet they provide vital habitat and food for birds and beneficial insects. This sale offers many native shrubs and a few great trees that deserve more use in our area. Green Community Connections is having a Fall Native Tree and Shrub Sale, co-sponsored by West Cook Wild Ones. It will be by pre-order only, opening August 5, 2016 and ending September 17th (subject to plant availability). Pick up is September 24, 2016. We are open for orders! Please tell your friends and neighbors. The location will be the parking lot at Euclid Methodist Church, on Washington one block east of Oak Park Ave. The lot entrance is on the east side of Euclid, just south of Washington. Some parking is available there and on the street. Due to the size and cost of these items, there will be no additional available the day of the sale, but only through pre-orders on this site. We will have volunteers to help you load your trees and shrubs into your vehicle. All plants are from Possibility Place Nursery in Monee and are grown from seeds local to the greater Chicago area. Please contact us if you have any questions about species, conditions, etc., at westcook@outlook.com. When viewing each plant category (Trees, Shrubs) you can pick terms like ‘Sun’, ‘Shade’, ‘Berries’, ‘Butterflies’, etc. to find particular types of plants, and use the search box at the top right for anything else. View information about them by selecting from the categories below or ‘Buy Plants’ on the top menu bar. If you are new to natives, please read our Plant Care FAQ for some tips and information. All trees and shrubs are in 5 gallon pots unless otherwise noted. All plant photos copyright Possibility Place Nursery unless otherwise noted. We are grateful to have been able to spend some time purely socializing and talking in order to get to know some of our members and supporters better. We send a Silphium-sized thank you to Patti Staley, Director of Horticulture, of the Oak Park Conservatory. She led us on an informative tour of the three showrooms, one of which has been aligned with a Mediterranean climate to be more sustainable in its use of water and energy. Even with the plants that are in the conservatory and are not native to IL, they educate the public about the ecological roles the plants play elsewhere, which is something that seems to be missing from most conservatories. If you haven’t seen the native plantings, you should go and see the many beauties showcased there. Queen-of-the Prairie is in full bloom, happy in its spot out front. The grasses are marvelous, and the bioswales along the side street are beautiful and functional as well. Rattlesnake Master which is in the exploratory garden is blooming too. What a rare treat for the public to see these iconic prairie plants up close and personal. It’s a great way to connect to our local natural history. We also had some delicious food provided by Sugar Beet Co-op, Geppetto’s Pasta and Pizza, Hemingway’s Bistro, Soul Food 6978, Grape Leaves, Spiced and Infused, and Todd and Holland’s. Thank you for helping us have a great time! Our plant sale went very well, and thank you to all who braved the cold weather to get your plants and to those who volunteered. If you’d like to volunteer for different upcoming events, please us this Google Form: WCWO Volunteer Opportunities. We need help at tabling events (Green Days at Oak Park’s Farmer’s Market May 21 & 28 are coming up, and there are some small public gardens that need attention and plants added). Special local showing of Symphony of the Soil! We will be sponsoring a screening of Symphony of the Soil at the North Riverside Library on April 3rd at 1:30 PM. Please RSVP to North Riverside Library: (708) 447-0869 or sign up online at www.northriversidelibrary.org/events. The Surplus Project! We are so happy they won–they will be diverting excess fresh and nutritious cafeteria food from landfill and toward shelters and other organizations providing for people in need. Food waste is a serious issue on many levels; it is an irrational misuse of resources (land use, water, pesticides, fossil fuels, electricity). Food waste in landfills is a significant source of methane, one of the strongest greenhouse gases. West Cook Wild Ones will continue to move forward with our Living Landscape Project partners; while we may have different missions, they all overlap and complement each other. We appreciated getting the support and advice from the entrepreneurial leaders and from the Oak Park River Forest Community Foundation. Our work is truly valued by so many in our community, and we are proud to continue to deliver programs and support native gardens because we truly believe (and know) that what we do is of vital importance to everyone. The collaboration called The Living Landscapes Project was formed by West Cook Wild Ones, Green Community Connections, Treekeepers, the Oak Park Area Edible Gardening Cooperative and Go Green OPRF. The Living Landscapes Project was named as a finalist for the Big Idea Grant, among many other wonderful big ideas. Were excited about this unique opportunity to raise awareness about the critical importance of landscape-use. On Feb 25, 2016, we go onstage to pitch our idea to a panel of 40 judges OPRF Community Foundations Entrepreneur Leaders in Philanthropy. A $50,000 grant is on the line. We could win! Come root for us! We are so grateful to all those who have provided support to West Cook Wild Ones over the past few years by becoming members, volunteering, attending conferences and meetings, buying and growing plants in your own yards, supporting the creation of more native public gardens, and spreading the word to friends and neighbors. Weve worked hard to get this far! Thank you–stay tuned for more details. Paddy Woodworth on Ecological Restoration: Key Conservation Strategy or Nostalgic Anachronism in Our Climate Change Century? The answer is: Key Conservation Strategy. Paddy Woodworth, author of Our Once and Future Planet: Restoring the World in the Climate Change Century presented to a large audience of over 200 engaged people who came out to hear Paddy detail positive and effective ecological restoration sites he has visited over the world. He began with discussing some of the restoration projects in the midwest, and indeed they receive an entire chapter of their own in his book. Paddy stressed the important role that communities can play in incorporating native diversity to support restoration. The integration of natural features into developed areas can play an important role in uniting and strengthening restoration efforts on open areas. Paddy researched the initial set-aside of land in the Cook County Forest Preserve system and the associated restoration efforts. Unprotected areas between larger parcels such as the Forest Preserves can serve as “hybrid” areas that buffer and support the larger ecosystem restoration activity. The U.S. is not the only country grappling with its loss of biodiversity and attempting to remedy land/biodiversity degradation and loss. At the very southern end of Mexico are the Lacandon people who have a system of using the rainforest to farm, and once the soil is exhausted, they systematically restore the rainforest. They know exactly the succession of plants and how to manipulate them in order to re-grow the rainforest. 10,000 miles away in Australia, Paddy explained another impressive restoration: the Alcoa Mine, which removed a section of the Jarrah Forest (one of the most biodiverse forests in the world), and then removed the 12 feet of topsoil to get to bauxite. Once they removed all the bauxite, they then began the process of restoring the section they had destroyed. After 20 years of post-restoration, the biodiversity is 98% of what it was. The remaining 2% are anticipated to arrive once there is dead wood, since many organisms (animals, fungi) rely upon dead wood as an essential resource. One of his themes is the need for social restoration between different groups and their perspectives on and relationships to nature. According to Paddy from his research and interviews with different restoration groups across the globe, the most effective restorations occur when the public is involved and their experiences and relationships to a natural area are also included in the restoration plans. He also spent several minutes on a new threat to restoration, which is one that is called “Novel Ecosystems,” the term was created as a positive spin on something that is very destructive. Essentially, novel ecosystem theory tells us not to worry about invasive species and to plant according to our desires without concern for their effects on the natural world. Paddy left us with a lot of think about but also left many of us feeling that we are on the right path and that restoring biodiversity is possible and essential. If you missed the presentation but would like to hear Paddy discuss some of these issues, you can hear him on WBEZ’s Worldview Soundcloud: Jerome McDonnell’s Interview of Paddy Woodworth. The program was co-sponsored by West Cook Wild Ones, Green Community Connections, PlanItGreen, Du Page Wild Ones and the Oak Park Public Library. valuable access to the central topics, key developments, and contentious issues bound up in the young and evolving field of ecological restoration. Paddy Woodworth is also a Research Associate at Missouri Botanical Garden, Adjunct Senior Lecturer at UCD, and founder member of the Irish Forum on Natural Capital. Sponsored by DuPage Wild Ones, Green Community Connections, PlanItGreen, and West Cook Wild Ones. What an inspiring, uplifting event the conference was! Over 300 attendees were alternately moved, awed, and amused by Dr Tallamy’s presentation, and then the workshops kept up the momentum and tone of Tallamy’s talk. We also heard from people who are now continuing that momentum into their own yards and even into their larger communities. We cannot articulate how much this means to us; it will continue to drive us forward. Thank you to all of you for attending the event and for your own continued dedication to creating more native gardens that continue to support the biodiversity we all need in so many ways. Please feel free to drop us a line about what you learned from the conference, and while we understand that we need to use a different system for the registration process if we host another conference, we’d welcome any other constructive feedback at westcook@outlook.com. To get the most up to date information about our other programs (our monthly educational programs are free and open to the public), sign up for our newsletter: Newsletter link. If you missed the conference and want to learn more about what you missed, read Tallamy’s New York Times Op-Ed piece: The Chickadee’s Guide to Gardening. He has a wonderful site too: BringingNatureHome.net. WildOnes is a 501c(3) Not for profit organization..